For those who don't know, WebExtension is a new Add-on architecture/specification that can be used even across browsers (to some extend). It is a browser native API interface with which you can write extensions with just web technologies. The core of the WebExtension API is meant to be standardized for ease of development in the future. For this article, I will be writing in the context of extension development for Firefox but some things may also be true for other browsers. At the heart and at the start of an extension is its manifest. The manifest is a JSON file that contains all sorts of information about the Add-on: Name, version, description, permissions, UI elements, icons, etc. Your extension will now be displayed in Firefox' Add-on page ('about:addons' in the URL bar or hamburger menu on the top right and then 'Add-ons') and is ready to use! That is all you need to know to get you Add-on up 'n running. You can go and try it out right now, I'll wait here. Note: When you make any changes to you Add-on during development, don't forget to hit the Reload button on the about:debugging page. If you want to see potential errors and/or log statements from your Add-on, there is a separate debug window for that (you will need it). Nearly all debugging information will be displayed in this window, we will see later why only nearly. Background Scripts are the highest level of script your extension can run. It has access to all default APIs and all APIs that you have granted through your manifest (such scripts are called 'privileged scripts'). 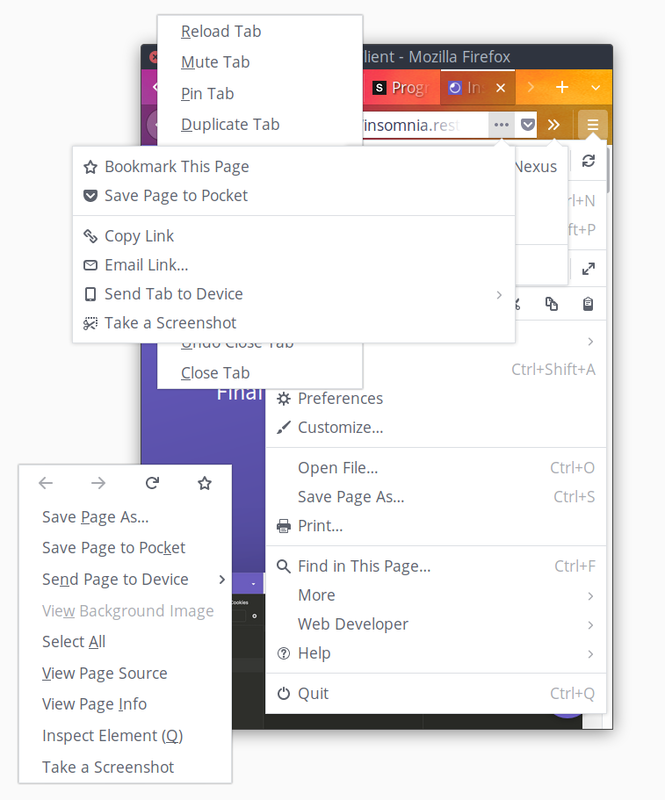 Background Scripts run independent of of any tabs (in fact they even have their own content process in the new Firefox), meaning that it starts its life on browser start-up (or Add-on installation) and ends its life when you close the browser (or uninstall the Add-on). The Background Script also runs across multiple browser instances (e.g. you have more than one Firefox window open at the same time). So, Background Scripts are your go to choice for 1) heavy lifting (there is an API to detect if the user is idle, which could be a good time for heavy tasks! (Please, do not do crypto mining. Ups.) ), 2) enure features that work independent of websites, and 3) use privileged APIs. From Background Scripts you can also register to events such as website visits, and then programmatically insert a script. Content Scripts are either inserted programmatically (e.g. through a Background Script) or inserted automatically (using the content_scripts manifest key) into a website. Once in, they can directly interact with the site's DOM. Content Scripts are not privileged scripts, that means they have only limited access to WebExtension APIs. Note: If you are unsure what your options are, you can find all APIs that are available to Content Scripts in this MDN article or you can always use a console.info(browser); statement and inspect its attached methods in the console. Scripts from WebExtension UIs. These include pages from Sidebars, Page and Browser Action popups and Developer Tools. They share a similarity with Content Scripts in that they get terminated as soon as the popup/panel/sidebar is closed. Their debugging information is displayed in the debug window alongside your Background Scripts, and they are also privileged scripts. The fact that scripts that are executed within popups only live as long as the popup is open is a limiting factor. So, depending on your use case, it is very likely that you will also need a Background Script page. The number of APIs you can use is limited by 1) the permissions that you granted through the manifest and 2) if the script in question is either a privileged script (Background Scripts, Sidebar, Popups) or a Content Script. Content Scripts can only use certain WebExtension APIs, but have also access to the DOM of the page they were injected in. Privileged scripts have access to all WebExtension APIs (except for these that require permission, in that case only if you have specified the corresponding manifest key). In case of privileged scripts that have a HTML page with them (Sidebar, Popups) they have access to their DOM. Background Scripts can also access their own DOM, but it won't be rendered anywhere. To get permissions in addition to the default ones, you can include them in the manifest and are then shown to users when they install the Add-on. "tabs", "storage", "https://awesome.com/*/", "notifications", "downloads"
Browser Action. This is an icon that is displayed in the toolbar, right next to other toolbar icons. When the icon gets clicked, an event is fired on your Background Script which you can subscribe to using browser.browserAction.onClicked.addListener(). Optionally you can also choose to display a popup when the icon gets clicked. Page Action. This is an icon that is displayed in the URL bar. In difference to the Browser Action, it is only displayed on certain websites (that you can define). When the icon gets clicked, an event is fired on your Background Script which you can subscribe to using browser.pageAction.onClicked.addListener(). Optionally you can also choose to display a popup when the icon gets clicked. Sidebar. This adds a sidebar (default on the left) and displays a normal HTML page (just as you would do with a normal website). In case of Firefox, threre is a global sidebar which has a dropdown for switching between sidebars. If you use this UI element, you side bar gets added to that dropdown. Dev Tools panel. Yes, if you want to enhance Firefox' Developer Tools, you can. Content Script. This is not directly a user interface component but nonetheless, it is a way to interact with you users. As explained further down, Content Scripts are injected into websites and can directly interact with the site's DOM. Notification. Does what it says. Address bar suggestion. This let's you listen for inputs in the address bar and then suggest links or actions. Pretty cool. Browser Actions, Page Actions, Content Scripts (optionally), Sidebars, and Dev Tools are defined in the manifest and can then interact with your extension's (background) scripts. On your previously opened debug window, click the 'Disable popup auto hide' button. This ensures that the popups always stay on top (and do not close themselves as they normally would). Note that it literally always stays atop, even when you switch to a different application. Don't forget to disable this option again when you are done, (it is even saved across restarts), otherwise you will end up with lots of popups_. You can now inspect popups without a hassle. Content Scripts only have access to limited APIs, but sometimes you need functionality that only privileged scripts can offer from within a Content Script. This is where the Messaging API comes in. The Messaging API is a simple way to communicate with your scripts. It doesn't matter if it is a Background Script, a Content Script, a popup or a sidebar. If I use runtime.sendMessage() from a Content Script, then all privileged scripts (such as Background Scripts) will receive this message. But, if I have to send two different messages for two different tasks, how can I know which one is which? 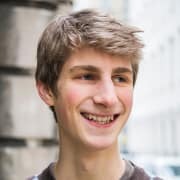 console.log( message.type )           // "notification"
console.log( message.data.url )       // "example.com"
For more advanced communication needs, you can also use runtime.connect() and tabs.connect() which lets you build up a long term communication channel where you always know who sent the message. Upload it to Mozilla's Add-on site. This is probably the choice for most people. Your extension gets reviewed and is then listed and searchable on the site and you also get handy usage statistics. Distribute it yourself. 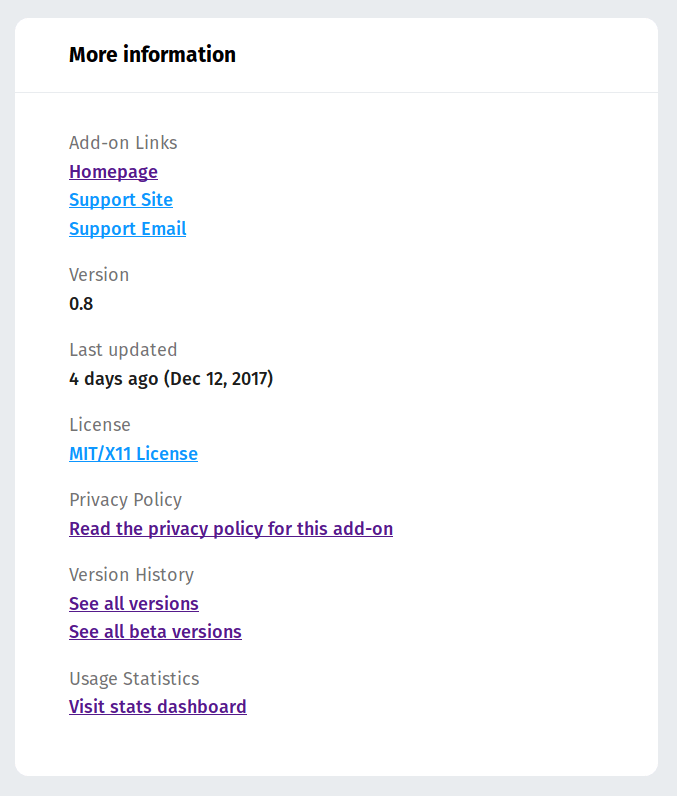 On addons.mozilla.org (AMO) you have the option to only sign your extension and not have it listed on the site. You can then distribute the signed Add-on yourself (e.g. from your website). To provide updates to the extension you then have to provide an update_url manifest key. AMO only uses the icons from your manifest on first submission for their Add-on pages. This means if you want to change your icon that is displayed on AMO after that, you can only change it through their web interface. If you first uploaded your Add-on without an icon and then added them later via an update, you also have to add them manually through AMO (I really hope this changes sometime in the future. This only applies to the icons used for the AMO website, not for Firefox' Add-on manager or other places). One last note, you can also have Beta releases of your Add-on on AMO. "A file with a version ending with a|alpha|b|beta|pre|rc and an optional number is detected as beta." The specified URL is a update manifest. This is a JSON file specifically used to tell the browser what the newest version is and where to get it. You can get a localized string by calling browser.i18n.getMessage('yourStringYouWantLocalised') from a script. Note that you have to translate your UIs (HTML pages) yourselves. This means, when an HTML page is loaded you will need some mechanism to apply the translated strings to your HTML. With my Add-on I solved this problem by giving each element in my HTML that is translatable a data-translate attribute. When the HTML page is loaded I have a small helper function called translate() that replaces the text contents of every element with a data-translate attribute. The function uses the value of data-translate to get the corresponding translated string that are specified in the messages.json files. If you sometimes feel out of luck and can't find a way around, there is also an official AMO forum. I have no idea how I initially found it, as it is not something that is not easy to find. You can go and have a look here. You will have to actually save the settings. This can be done with the Storage API: browser.storage.set()). When loading the settings HTML page you will have to initialize the input elements to their stored values. To get values from storage you can use browser.storage.get(). In Firefox 57, Mozilla dropped legacy extension support completely in favor of this new architecture. Before WebExtensions - as a developer making Firefox extensions - you could also use browser internal stuff. This led to a poor compatibility experience as things could easily break with updates and oftentimes there was no documentation for these internal functions. Mozilla tried to ease the development by providing an SDK, but it still wasn't perfect. So nowadays, writing a WebExtension is the only way to get a working Firefox Add-on. Phew! If you made it this far, congratulations! Writing this article was not easy but also lots of fun. If you have any question or I left something unclear, please leave a comment and I will gladly answer. Thank you. There is much more possible with WebExtensions than I could have possibly show in this post, so be sure to check out all the APIs and manifest keys on MDN.